'Interreg Talks' are a series of events aimed at demonstrating how Interreg works and how its cooperation model could be transferred. This year, 'Interreg Talks' promotes innovative communication approaches related to capitalisation of Interreg results, addressed to stakeholders and audiences other than usual Interreg practitioners. The Project Slam session will present high impact Interreg projects in the in an entertaining and easy way to the audience attending the EURegionsWeek. 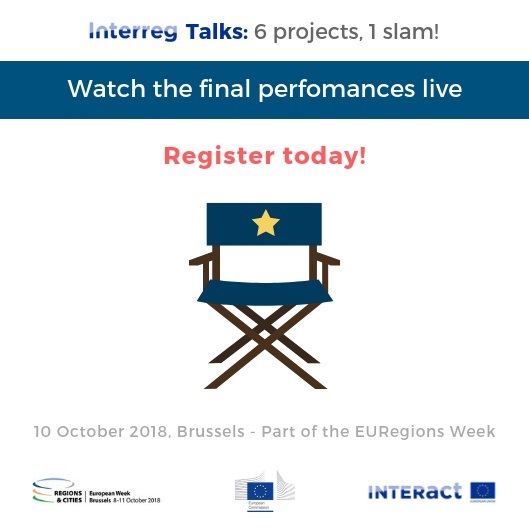 ‘Interreg Talks’ are a series of events produced by the Interact programme, aimed at promoting innovative communication approaches related to capitalisation of Interreg results. The aim of the ‘Interreg Talks’ is to demonstrate how Interreg works and how its cooperation model could be transferred to other areas and funds. The ‘Interreg Talks: 6 projects, 1 Slam’ workshop took place during the EU Regions Week 2018. The rationale of the event was to attract all type of stakeholders and audiences other than usual Interreg practitioners, willing to learn in a new and innovative manner, about good Interreg projects and their results. All the performances were made by the project representatives. The objective of the Interreg Project Slam has been to make the achievements of Interreg projects visible and understandable to the audience of the EU Regions Week. In order to achieve it, six projects presented their experience during the event in an innovative and entertaining way, avoiding formal language and long presentations. Instead, the projects did theatre plays and stand-up presentations. In order to be complementary to the EU Regions Week programme, the selected projects represented 3 thematic fields: a) Climate change adaptation; b) Inclusive Growth including migrants’ integration; and c) Cultural Heritage, in the framework of 2018 European Year of Cultural Heritage. RaiSE - Enhancing social enterprises competitiveness through improved business support policies, financed by the Interreg Europe programme. The performance hall was arranged as resembling a theatre in order to create the atmosphere of a gala event, with lights and sound effects, making use of the screen as scenography. All six projects performed, one after the other, in a maximum of eight minutes per performance. After all performances were completed, the audience was able to vote individually using their smartphones in the slido tool. The winner of the ‘Interreg Talks: 6 projects, 1 Slam’ was project RaiSE, followed by CLIMACT and BLUEMED. In addition, the social media award of the most liked video in Facebook was awarded to BLUEMED, which managed to get more than 15,000 ‘likes’. Finally, all participants of the projects obtained a certificate and an applause from the audience. "Communicating cooperation projects can be dynamic, engaging and entertaining experience for both the projects and their target audiences!" RaiSE: “For social enterprises, the journey to competitiveness is as difficult as climbing a mountain: a mountaineer from RaiSE project will explain you how, thanks to interregional cooperation, we can help social enterprises to be more competitive in the global market – a must see!”. ARCHIVE: "Ancient heritage interlinked with modern technologies to form a unique environment for learning, exploring and enjoying the cross-border area between Bulgaria and Romania - definitely worth seeing!" BLUEMED: "A wonderful journey to the BLUEMED’s underwater natural and cultural heritage sites, using innovative techniques, where all who are interested may have a unique experience either by visiting them as divers or through the Knowledge Awareness Centres". LOCATIONS: "From its cruise tourism niche, LOCATIONS demonstrates that, everyone, starting from local decision makers and competent authorities, are called to sustainably improve cruise passengers’ mobility and freight flows on land, while preserving local environmental resources and community wellbeing." DRIM: Integration starts with information! DRIM provides migrants in the Danube region with a practical online tool - where all the information can be found in one place. We raise awareness among our public institutions and decision-makers that improving access to information can improve lives of the new inhabitants.